Didlake is one of the more than 600 nonprofit organizations in the country that participates in the AbilityOne Program, the nation’s largest single source of employment for people who are blind or have other severe disabilities. As a private, not-for-profit provider of contract services and rehabilitative services, Didlake strives to positively impact the lives of people with disabilities, and it permeates everything they do. “We were looking for cleaning solutions that would save time and money plus make the job easier on our employees,” says Mike Payne, vice president of contract operations at Didlake. So Payne turned to one of his key suppliers, SupplyWorks, for ideas. “We have had a lot of success with Kutol’s Counter Mount Soap Dispensing System and thought that it would be ideal for Didlake,” says Brad Bobbitt, account executive at SupplyWorks. The Counter Mount System has many unique features that save time and money, plus its unique design makes it more accessible. The system is inexpensive and can be installed in five minutes or less. The innovative, patented design can be filled from above the counter using a unique resealable refill bag and docking station. Once installed, users never have to remove the ADA panel to refill, which is a task that can be very difficult. Users can easily refill one dispenser or top-off multiple dispensers with the same refill bag. Once the bag is inserted, the employee can move on to another cleaning task to save extra time. Because the bag can top-off multiple dispensers, users never have to throw away a partially filled cartridge. This feature can save up to 20 percent in soap costs alone. 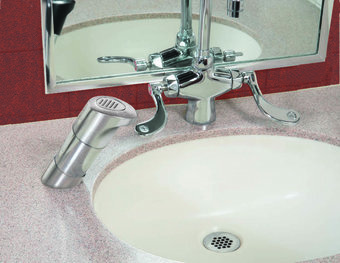 In addition, this system uses foam soap, which requires only 0.75 mL, or half the soap per handwash versus the 1.5 mL needed with most liquid hand soap systems. And because foam soap is pre-lathered, it takes less time to rinse, saving water costs. In addition, the Counter Mount System uses Kutol Foaming Luxury Hand Soap, which is Green Seal certified and Bio-Preferred. Not only is it better for the environment and preferred by government agencies, it can help earn LEED points under the LEED-EBOM v3 IEQ Credit 3.3 for hand soaps standard. The soap also helped Didlake maintain its Cleaning Industry Management Standard – Green Buildings (CIMS-GB) certification as a cleaning expert.